Eager science student Victor Frankenstein uses body parts of the dead to bring a creature to life. Although initially excited that his experiment is a success, Frankenstein becomes horrified at the grotesque being that stands before him and flees. Angered by the rejection, the monster retaliates by taking the lives of those dearest to Frankenstein. The decision to play God torments both Frankenstein and the monster he created until the end of their days. Amazing story and the narrator brings so much to the characters within. 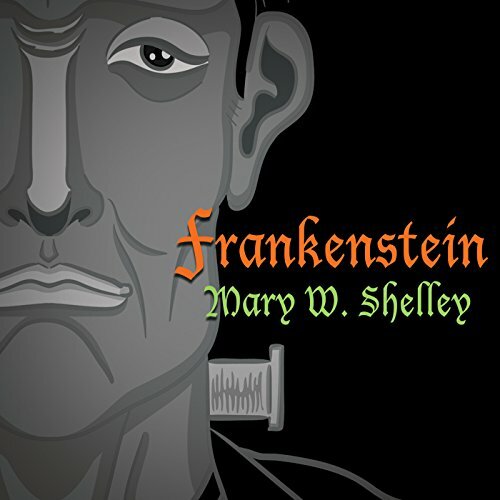 Mary Shelley wrote this so well and moves you throughout the novel. I followed along with a Kindle 1818 edition and there were many differences in language and text. Her novel was no doubt edited, censored and changed over the many years since it's creation. That said, the main points and whole ideal behind her story does come through well. Enjoy this novel....it has caused me to long for Paradise Lost now. Happy listening, friends. I can't pinpoint any one reason that this experience was so enjoyable except that the reader was never boring and the story was quite intriguing. I especially enjoyed the monster's point of view in this story. So different than I ever dreamed. I listen to so many books on audio and the performance of GJ is surpassed by none. I was tempted to listen in one sitting, but obligation didn't allow. However, I was anxious to get back to listening as quickly as possible. The reading was excellent! I had seen Frankenstein, Hollywood style since my childhood, (I'm over 50) so when I was required to read this book for an English college course I was not very excited. I intend to teach high school English/Literature and I dare say this is one novel I certainly plan to explore with my future teachers. This novel is well written with insight to the amazing story of "the monster". I would highly recommend this novel to all audiences young and old. It is by far one of my favorite books. Listening to this book on audio by this reader was pleasure. An absolutely flawless performance and epic story that will stir the imagination force you to question moral implications and leave empathic to all parties. The story strongly draws you in to love the characters, then leaves you in tragedy. Not for the light hearted but certainly for anyone that wants to think critically.